Not only has YouTube LEGO animator Snooperking painstakingly recreated the lobby shootout from The Matrix, he tweaked the ending to solve the movie trilogy's main problem. Despite the fact that Neo and Trinty are technically slaughtering countless innocent comatose machine batteries on their way to rescue Morpheus from Agent Smith (it's the smell, if there is such a thing), the lobby gunfight from the first movie was one of the coolest moments in the entire trilogy. 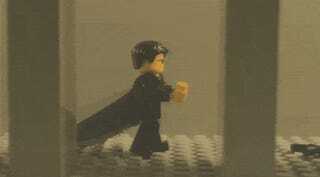 Snooperking's LEGO version is perfect, right down to surprise ending.